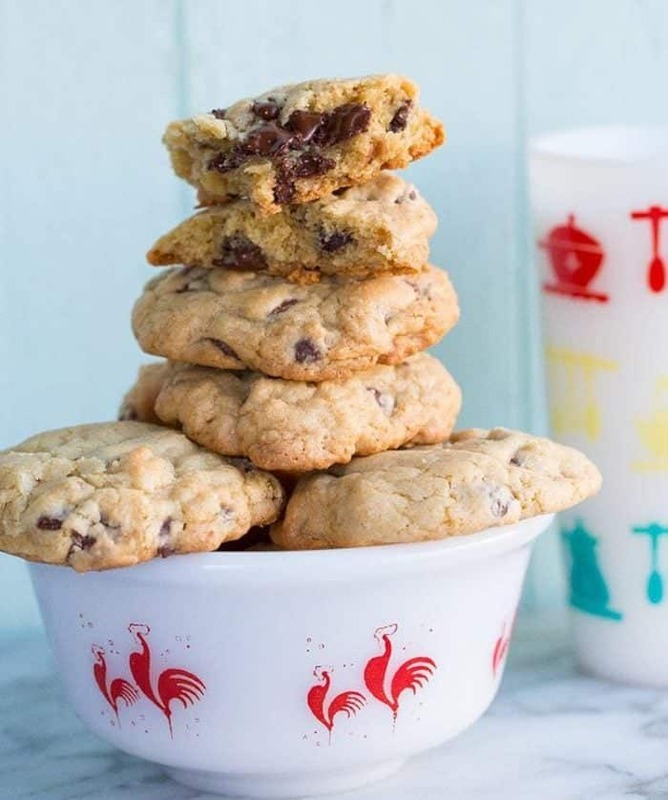 I swear to god I make this recipe once or twice a month, it is absolutely my go-to cookie for whenever I need to bring a treat for my friends or when I need a pick me up after a bad day. Comes out great every time, thanks for such a great cookie! 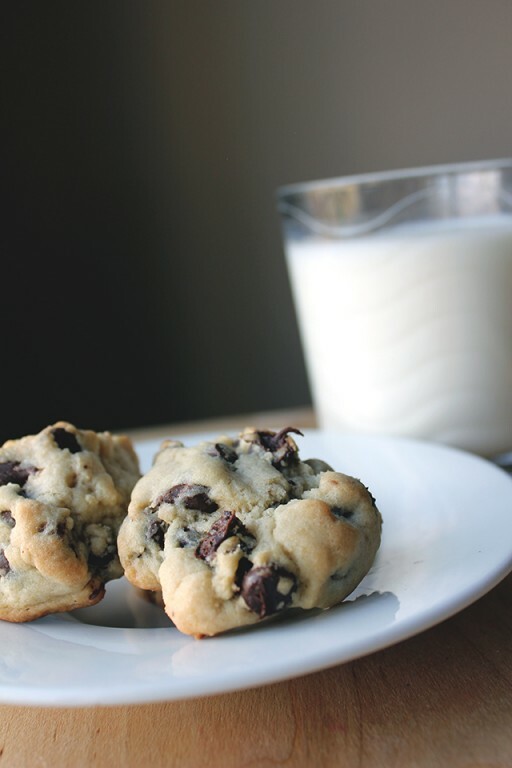 Can I use milk chocolate chips? Hi Karen, thank you for sharing your recipe. My lady loved them. She has been so busy at work these days and hasn’t had the time to bake. So, I surprised her, and I baked them tonight. These are the kind of cookies she loves. Nice and chewy. This was the very first time that I have baked cookies, the last time was home-ec-class, which was many, many moons ago! I had no clue what I was doing. To be honest, I never really bake. Not even a Betty Crocker cake. However, I’m the main chef around here. So I improvised. Another thing, we don’t have a mixer. What I did, I pressed the butter and sugar together with a wooden spoon until it was creamy. Then added one egg at a time. Then the vanilla. Then used the wooden spoon to stir slightly. Then I thought, hey, let’s try a whisk. Then I read your directions, then noticed that I was to whisk the dry ingredients, but I ended using a fork to whisk the dry ingredients because I dirtied the whisk. The whisk really didn’t work with the sugar butter mixture anyway. I ended up kneading it with my clean hands and then slowly added the dry ingredients in with the butter, eggs and vanilla. Then I added the chocolate chips. All this, while I was pre-heating the oven. When it was time to put the cookie dough on the cookie sheet, like your directions read, I used the measuring teaspoon and scooped the cookie dough with it, put the teaspoon ball on the cookie sheet. They looked so small. However, I believed in your recipe and followed the instructions. It was so exciting to be baking. I had a bit of a rush going on here! Actually I still do. Sorry for the long comment by the way! I set the timer for 12 mins. After the timer went off, I pulled them out, it didn’t look brown, I added another 2 mins because when I pressed down on one of the cookies, it felt too soft still. It could be my oven. Your cookies looked brilliant coming out of the oven in the end. The aroma was fantastic! The cookies looked like they belonged on a cover of a cooking magazine. After I took out the first batch, I took some photos and sent them to my dad, he is a retired baker, he was impressed. And I sent a photos to my mother. She told me they looked perfect. She told me to press down on the cookie, and if the puff back out after pressing down on them, they are ready. Karen, I’m so happy that I followed your recipe to a “T” you made this guy look like a rockstar! I will keep your recipe in my back pocket and bring this to potlucks etc. These are the best tasting cookies I’ve ever had. My girl agrees. Way better then any supermarket or bakery. Thanks again Karen, you rock!!! Karlynn, sorry I called you Karen and your name is Karlynn. Wayne thank you SO much for the amazing comment, you made my day! 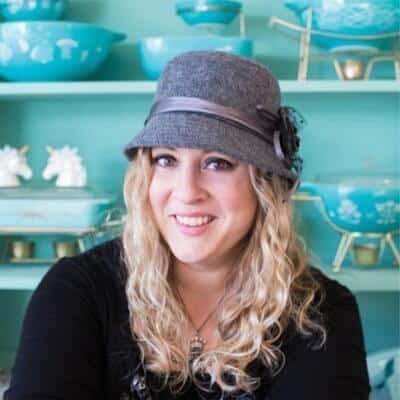 Your cookie baking experience is why I love doing what I do! Thanks for letting me know, I love reading comments! Yo, can you use self rising baking flour instead? I’ve never tried it. Use at your own risk! Karlynn, question: this recipe is the same as many other chocolate chip cookies recipes I see except that it uses half the amount of butter. Can you comment on what more or less butter does to the final product? Thank you! That’s what makes them thick and chewy! Let me start out by saying, I am no baker by any means, I’ve never made a cookie that I’ve ever been proud of. This recipe was so easy though! These are the tastiest, fluffy, gooey cookies I’ve ever had in my life and the only recipe I will ever use from now on! I want to make these every day! I made these with gluten-free pie flour, sugar-free chips (sweetened with stevia) and a tiny amount of additive-free stevia instead of sugar (so I used no sugar whatsoever). I added a tiny bit of milk to the dough and used baking powder instead of soda. Despite my many modifications they turned out PERFECTLY: thick, fluffy, chewy, moist soft, delicious. Firm on the outside, soft on the inside, nice, fat shape. Thank you for the recipe. Not sure how people got flat cookies. I’m a terrible cook and mine turned out thick n fluffy. hi, how much stevia did you add? so no other substitute for the granulated or brown sugar? These cookies turned out flat even if I put them in the fridge. I put them on really thick and they still went flat. They were also on low heat but still had soggy bottoms even if I cooked it for longer. I wouldn’t attempt to make these. But they did taste nice. I had made a Martha Stewart cookie recipe and they turned out flat as a board. 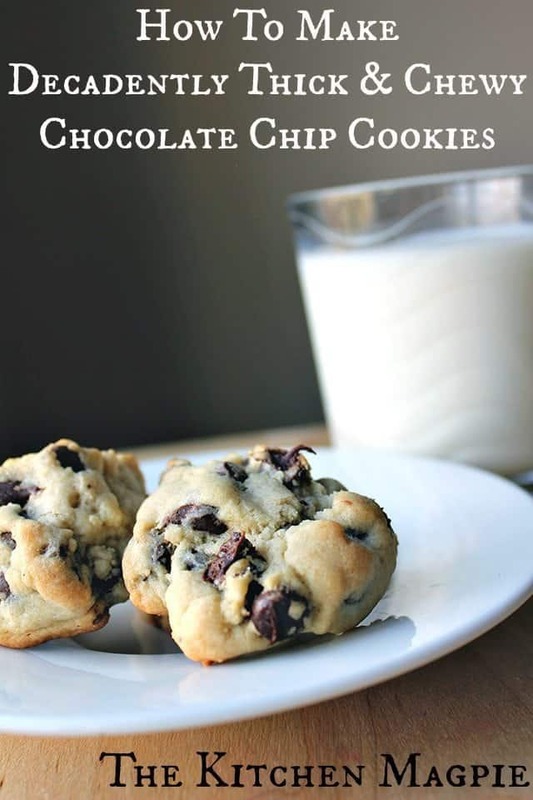 So I looked for a thick, chewy cookie recipe (because I know they exist) found this one and tried it. I followed the recipe exactly. It wasn’t raining and I am not at high elevation. They turned out slightly thicker than Martha’s cookies. They look nothing like the picture in the recipe!! I wish I could upload pictures of how they turned out. This was a waste of time and ingredients!! Double check the ingredients. Baking soda is the key to getting them thick and chewy not baking powder. Try freezing them for 5-7mins before baking them for the recommended time. I’m so bummed. 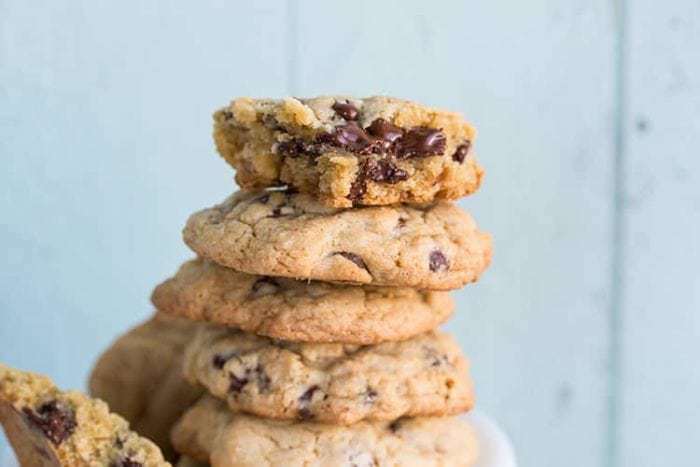 I’ve tried so many “no fail” chocolate chip cookie recipes, including yours, only to have the same dismal results: flat, run together cookies that turn crisp shortly after they’ve cooled. I followed your directions to the letter, with one exception. All I had on hand was Bob’s Red Mill fine pastry flour, not all purpose flour. Is that the problem? I also live at a slightly higher elevation… 2, 500 ft. I even refrigerated the dough for several hours before I baked them. HELP… I hate flat cookies! I’m so bummed. 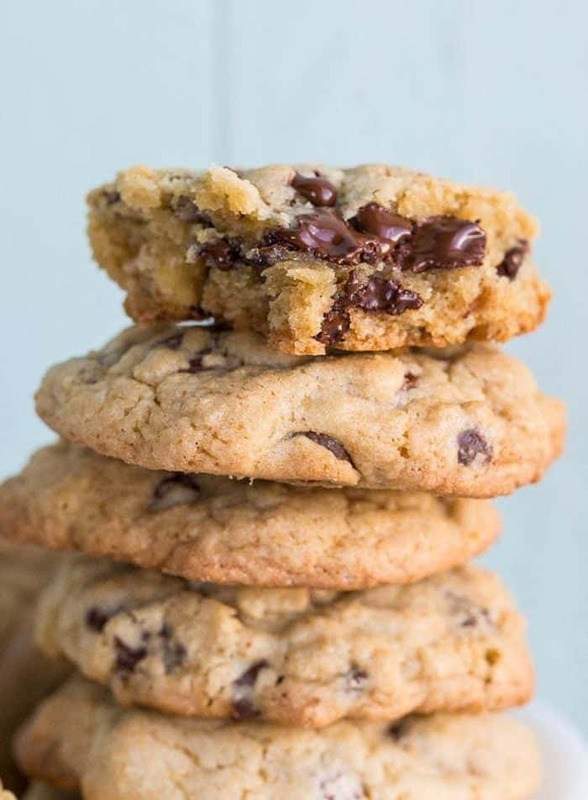 I’ve tried so many “no fail” chocolate chip cookie recipes, including yours, only to have the same dismal results: flat, run together cookies that turn crisp shortly after they’ve cooled. I followed your directions to the letter, with one exception. All I had on hand was Bob’s Red Mill fine pastry flour, not all purpose flour. Is that the problem? I also live at a slightly higher elevation… 2500 ft. HELP… I hate flat cookies! Yes, pastry flour was absolutely the culprit here! You need a heavy all purpose flour! I love this recipie! I have made it with chocolate chips, Reese’s pieces, M&Ms, and white chocolate chips (my favorite). No matter what sort of mix-in I use they come out perfect every time and they get rave reviews!